Scott and I made the 10 hour drive down to Hellgate again this year. 2013 was the last time I ran the race; that was the snow/freezing rain year. I felt I could better my time on the course and I love spending time with Dave Horton and the many cool people who show up to run his races. I am lucky that Scott is such a strong driver. We left very early Friday morning, driving most of the day. After a few stops to stretch, eat, and for Scott to ride his bike; we got to Camp Bethel in time for the bib pickup and dinner. We were happy to visit with some people we had not seen in a long time; Sheryl Maun, Sheryl Wheeler, Zsuzsanna Carlson, Jordan Chang and some friends from home; Jerry Turk, Dan Broom, Sarah and Scott Slater, and Brian and Amy Rusiecki. We even made a new friend, Mike Siudy. Pre-race meeting was a blast with a lot of references to pooping. “Poop here!” Dave repeated. He wanted to be sure people remembered to use the bathroom before leaving the camp, and not to go at the trailhead where we would be driving to in a couple hours. Scott and I retired to our squeaky bunks to each get some shut eye for an hour and a half. Some people choose to stay up. I can never decide if it’s better to sleep a bit, or not at all. At 10:50pm everyone was to be in their cars ready. We caravanned to the Hellgate trailhead and waited there in our heated cars for Horton’s beckon. The temperature at that point was about 20 degrees F. When it was 12:01am Horton yelled Hellgate and we were off. I focused on being conservative and got into a groove with the others around me. In his pre-race speech, Horton warned there would be two water crossing before aid station 1 and to not bother trying to stay dry. Really??? This worried me a bit since I have trouble with the cold in my extremities. Well, he was right. There was no way to avoid wet feet, so I embraced the challenge, but slipped on a rock in the process, and dunked my right hand in the water. Luckily I already had chemical heaters inside my mittens, so my hand stayed warm even though the mitten was frozen stiff! We had a huge dirt road and wooded climb after aid station 1. The top was windy and in the single digits. Crew was allowed there. Scott was at the top of the hill. I switched my mitts out, changed into a bigger hydration pack and hurried out of there. I would not be able to see Scott again until aid station 4. I made some great decisions with my attire and was doing well with the cold. I wore a pair of winter fleece tights and a heat reflective jacket from Athleta, a thermal Patagonia top, fleece hat, Darn Tough socks and Outdoor Research mittens. I don’t remember much between aid stations 2 and 3 or even 3 and 4, except a long downhill of switchbacks with a steep dirt road uphill at the end. 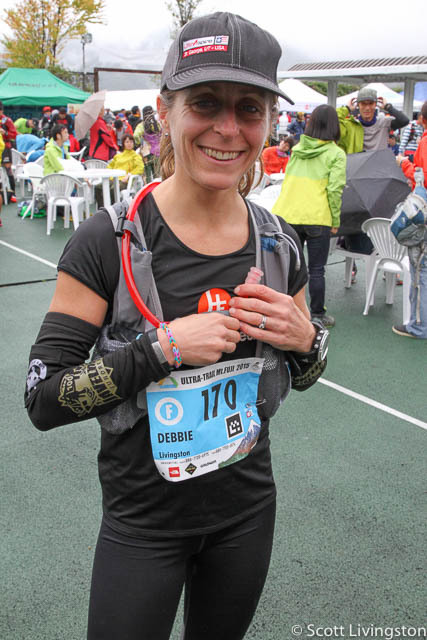 At aid station 4, I decided to change my top to a thicker thermal. My jacket was working great and my legs felt good. I did add another layer on my hands and a Buff around my neck too. I thought I might change my socks and shoes but quickly realized that my laces were frozen and could not be untied without a lot of work. So, we skipped that. I took in a good amount of food here. It was the coldest part of the night at around 4am. Somewhere around 8 degrees F. Cheese pierogis and veggie broth with white rice were my breakfast. My energy bars were frozen solid. Luckily I was still about to eat them without breaking my teeth. The next section was a lot of old logging roads that were grassed over, some singletrack and some dirt roads. At one point, I noticed a black and white object on the ground in front of me. I thought it might be a glove someone dropped but then it moved. It was a baby skunk! A jolt of fear pulsed through me but quickly dissipated to admiring its cuteness. The sky was so clear at a couple points, that I turned off my lights and looked up at the stars. They were spectacular! I was very happy with my UltrAspire Lumen 600 waist belt. It’s amazing beam of light made it very easy to see the trail ahead. I wore a headlamp for back up but only turned it on when I wanted to push on the downhill because it added another angle of light. Popping out into aid station 5, I was feeling pretty good. Three years ago, the next section was my hardest. I walked a lot and was passed by many people. I was determined for that not to happen this year. I felt mostly good through lots of climbing and descending to aid station 6 and with the sun shining bright, it was somewhat invigorating. I made it to aid station 7 in a much better state than three years ago. I decided to change my shoes. Since my feet thawed out I noticed a few sore spots on my toes. The laces were still frozen so we had to unthaw them with hot water. That worked great and I had new socks and shoes on in no time. I had less than twenty miles to go, but this part of the course had a lot of side-hilling. The leaves were piled knee high in many places with loose rocks hidden underneath, ready to twist your ankle at every step. The trail kept weaving along the side of the mountain; in and out, in and out; it was maddening. I whimpered many times as I wanted to move faster but couldn’t, either because my legs were tired, or because of the hidden ankle twisters. I was also craving some company but never really found anyone that I was in sync with. There was one gentleman that I would see at every aid station but when there was a hill he would climb away from me. Scott met me at two more aid stations to change my pack and to give me encouragement. 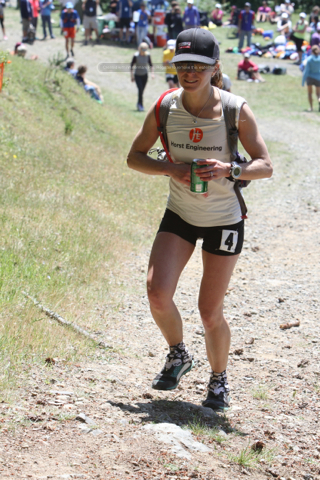 When I hit aid station 9, I was told it was about 3 miles up and 3 miles down to the finish. I focused on moving as fast as I could go. Being uphill, this was about a 3 mile per hour hiking pace. I kept pushing. I had been hoping for 15 hours but that time had passed. Now I had the desire to, at the very least, beat my previous time. At the top of the climb I had to cross a road but first had to pause and let a car pass. They gave me a little beep….I am sure that I looked a bit “out of it” and they did not want me to get hit. It was all downhill from there. I turned off my pain receptors and started running. Pushing the pace, I could feel my right big toe throb with every foot strike. Not too long down the trail, I passed the gentleman from Chile, and then Scott showed up on his bike. 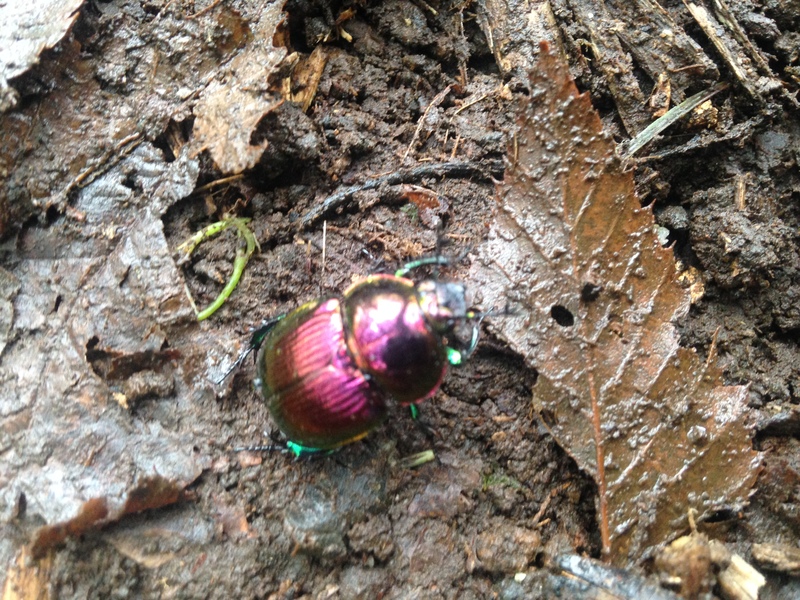 He cheered for me as the trail turned to dirt road. I passed the gentleman from Japan. I pushed harder to reach Camp Bethel. The time was slipping away. I turned the corner to run up the driveway to the finish, following the ribbons in. I crossed the line on 16:00:29, just shy of getting in under 16 hours but exactly 3 minutes faster than three years ago. That big toe had the largest blood blister that I have ever had. I think it was due to having a frozen shoe and sock, since I never get blisters. My quads were trashed from pushing so hard on the downhill at the end of the race, but my heart was full—I was elated that I endured the freezing cold and long climbs to finish such an epic race for a second time! After top 5 woman received their prizes I was awarded first “Old Lady” coming in 8th woman overall. I was given a Patagonia Nano Puff Air vest to wear with pride. Back in January, when searching for an ultra race I found Zion 100 and noticed it backed up nicely to my kids’ school vacation. I convinced Scott that we should go and then spend some time in Zion. He moved some work around and I contacted my hydration pack sponsor owners, (UltrAspire) who is based near Zion. I asked for some advice on where to stay, eat, what to see. Melanie and Bryce Thatcher promptly offered us the opportunity to stay with them. We were psyched to stay with friends, and accepted. My training leading into Zion was challenging. Just seven weeks before the race, I got very sick with the flu and bronchitis. The illness took me out for two weeks in the peak of my training cycle. I was still able to get a big running weekend in five weeks out but lost a lot of miles leading into that period. But, I stubbornly believed I could still make this happen. We left Thursday morning from CT and arrived in Las Vegas mid afternoon to drive two hours to St. George unload and then drove another 40 minutes to the pre-race meeting and bib pickup. It was a long day and I was getting a bit nervous feeling rushed and unprepared. Scott and I got up early the next morning. I had a hard time sleeping anyways. We got to the start in plenty of time, where I did my best to stay warm and chill out. The race went off at 6:05am with headlamps on and I got in a nice rhythm on some dirt roads. Scott headed back to pick up our cousin Danny, Shep and Dahlia. We began the climb up to Flying Monkey just reaching the top of the mesa as the sun came up. It was a fun six mile loop around the mesa before heading back down the same path which was my favorite part of the course. I went back onto jeep trails and then to Dalton Wash Aid Station which was listed at mile 15 on my course info but was really mile 13. I was ahead of schedule pace-wise but now also ahead of schedule because the milage calculations were wrong. I figured I would miss Scott, Danny and the kids and I was right. I filled up with water and took off, knowing they would be disappointed that they missed me, but I shook it off. Plus I had carried plenty of food. We had a very long uphill dirt road through farm land to the top of the next mesa. Guacamole Aid Station was well stocked. I refilled water and headed out on the loop. The loop on Guacamole was a challenge to follow because it was mostly rock and there was no logical path. I stuck with a group of guys that were cracking me up with guacamole jokes which took my mind off of running for a while. Some of the trail was very close to the edge with beautiful views. There were quite a few mountain bikers up there. Back at the aid station, I grabbed some oranges and headed right back out on the dirt road. The sun was starting to peek out from behind cloud cover and the temperature began to heat up. I was starting to struggle a bit but knew that was part of every ultra. 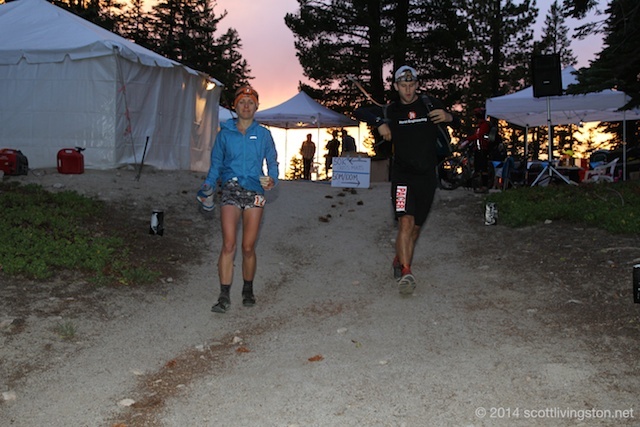 It was fun to roll down into the aid station and hear Shep and Dahlia cheering. Shepard ran along side me into the aid station and I changed packs, used the bathroom, which was a composting bucket in a tent, and headed out. Looking back I probably should have stayed there a little longer to eat and drink, because after crossing the main road and getting onto another dirt road uphill I felt sapped of energy. I ate more and drank more, but it didn’t help. I walked a lot, jogged a little. That still did not help. Eventually I made it to the steepest climb on the course, 1,000 ft in less than a mile. Luckily I was with Steve LaBranche, a fellow Shenipsit Strider, for a while, and then chatted with Kelly Agnew on the entire climb. At the Goosebump Aid Station I grabbed more real food and continued out onto the Goosebump loop. I was still struggling and it really started to bother me that after all the walking and eating that my energy was not coming back. I jogged and walked out to the Gooseberry Point Aid station where we had to do a short 1/2 mile out and back (we had to get a hole punch on our bib number as proof). On my way back, Steve was coming at me. He had gotten off course for a bit and ended up behind me again. We stuck together for a while and he was running stronger so he moved ahead until we bumped into each other once again. 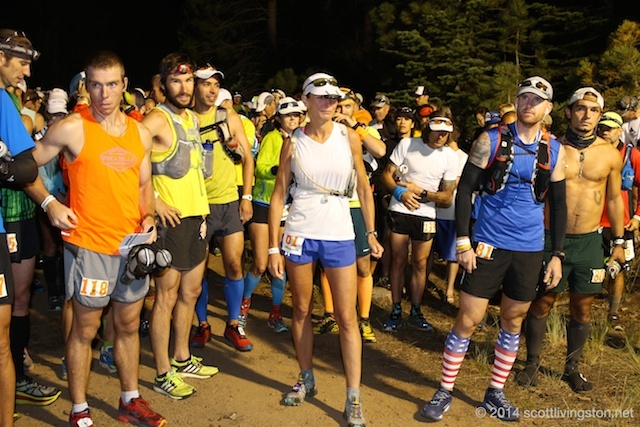 As we got very close to returning to Goosebumps Aid Station, I heard someone yell my name. It was Melanie and Bryce Thatcher, our hosts. They had driven up to cheer and take pictures. I let them know I was in a funk for the last four hours and was struggling to decided what to do. I got into the aid station, sat down and thought hard about my choices. I still had 53 miles to go in the 100 mile. At this point the 100k runners go left and the 100 mile runners go right. I drank some veggie broth, soda and asked the volunteers if dropping to 100k was an option. Scott and I have talked about this many times. I did not feel I needed to DNF. I could still walk, but I could not fathom waking 53 miles. Uncharacteristically of me, I did not have the desire to go longer nor to spend the night out. I didn’t see my running legs coming back since they showed no sign of returning for the last 17 miles. I convinced myself that I should go on and turned right (onto the 100 mile course), running out with Steve. When I tried to run again my legs were lead. I promptly stopped, gave Steve and hug and wished him luck. I ran back to the aid station and declared my move to the 100k, turned left and started my 16 mile journey to the finish. Kindly, Melanie contacted Scott to let him know of my decision and to meet me at Virgin Aid Station instead of Grafton Mesa Aid Station. The walk down the steep section was frustrating and inspiring. 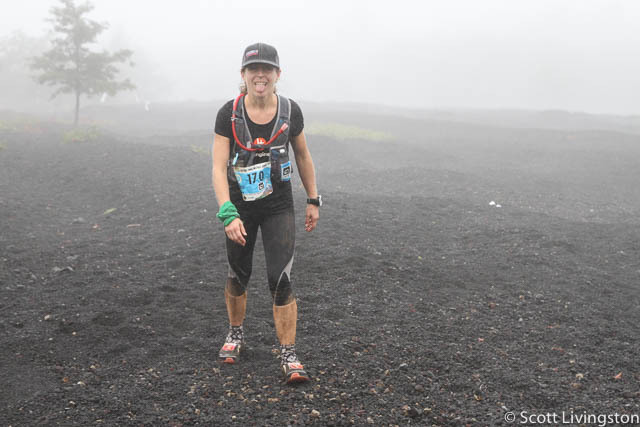 I was frustrated at my mental and physical inability to complete a 100 mile event and inspired by the people who were just coming up the steep hill. The perseverance and fortitude they demonstrated so may hours into the the race with so many miles to go was amazing. 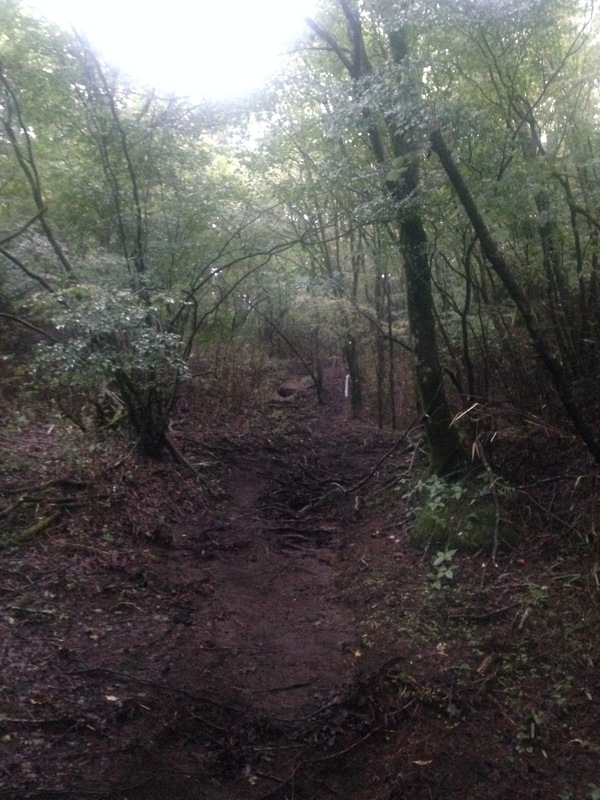 The trail leveled out onto the dirt road and took a left turn toward the aid station. Unfortunately, this section was all dirt road that winded and twisted it’s way through the dessert. My attitude was deteriorating and with no-one around I was left to ruminate on my decision and beat myself up a bit. To top it off I tried jogging again and promptly tripped, slammed my knee on a rock and rolled in the sand. I laid there for a minute, contemplating my challenges. For a moment I was upset, but then I remembered the beauty above me and around me. I dusted myself off and moved on. After what felt like hours I saw a mirage coming toward me. It was calling my name and it wan’t a mirage, it was Danny. He had changed into running gear and ran out to greet me. I didn’t think he was going to run with me at all since he has the Boston Marathon in just over a week, but he is an ace crew/pacer and wanted to prod me to the finish line. We came into Virgin Aid Station. 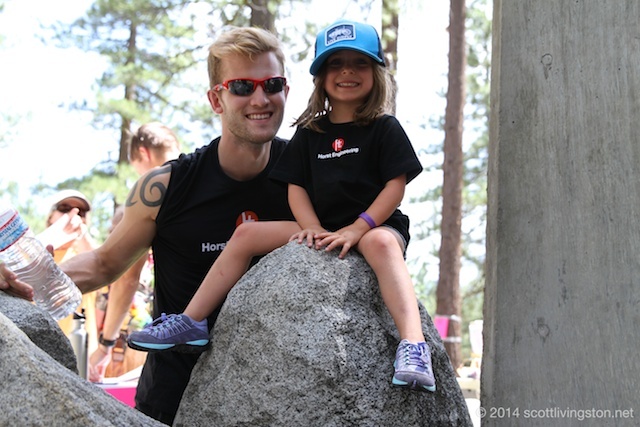 It was great to see the kids and to know that I was only eight miles to the finish. They fed me and changed my hydration pack. 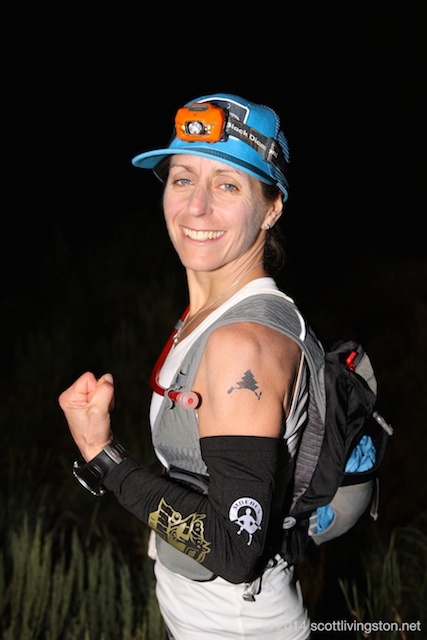 I put on my UltrAspire 600 lumen waist belt and threw on a head lamp. I put on my Patagonia Houdini jacket as well. As it started to drizzle we got back the trail. In a few minuted the skies opened up. The rain was cold and the mud turned to ice. I ran right in the center the trail in deep puddles. There was no way to stay dry and that was the safest way since your foot would slip down anyways. I got really cold and tucked my hands inside my jacket sleeves. I was running again and needed to, in order create heat. 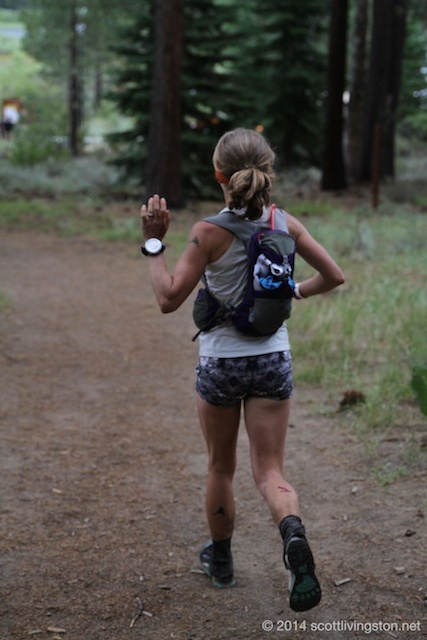 I thought about the 100 mile runners and the challenges that lie ahead. At that moment, I was happy that I made the decision to run less miles, but I knew later I would not be so content. We were finally on single track again that weaved alongside a canyon with a 100 foot drop. Danny was so scared that I would trip or slip off the side. Just like a cautious dad, he kept reminding me to stay away from the edge. I was scared for the runners that would be coming through there at night. The lights did need to go on a few miles from the end. Danny is such a good pacer, that he kept me running and got me to the finish, completing those last eight miles in about 1 hour and 40 minutes. I placed 4th female and first 40+ female. It was disappointing to not finish what I set out to, do but it felt good to be able to go home at a reasonable hour to shower and get to bed. The kids were troopers, Scott is an amazing supporter, and Danny is an all-around super helper. No one can really know all the “hurry up and wait,” that they do, all the route finding, worrying and other challenges they face. It’s a really tough job and they do it because they love and care for me. I am truly blessed to have such a supportive husband and family. Reflecting on the experience, I only wish that I had been better at evaluating my fitness and readiness and decided on a shortened distance before the start of the race. It bothers me that I did not complete what I set out to do. I was very lucky there was an option to drop to the 100k. In most 100 mile races, there is not. 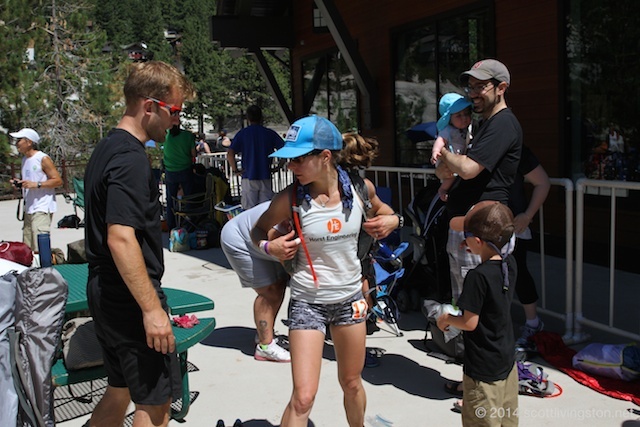 The flip side of that is “what if?” What if I did go on in the 100 mile? Maybe things would have turned around and I started running well again. Maybe I would have deteriorated further and needed to drop…..we will never know. But that’s life, right? I want to thank my coach, Al Lyman, for going along with my crazy ideas for races and doing his best to get me ready for this race with short notice and sickness. A huge hug to Melanie and Bryce Thatcher, our hosts and tour guides for this adventure. They are the owners of UltrAspire, my most favorite hydration packs (and now running lights) in the world. I am also thankful that Altra shoes were invented because now my feet are finally happy. So I’ll be able to see when I’m 93, I grab my Julbo sunglasses for all my races. And thank you, thank you, thank you to Horst Engineering. My biggest supporter of all! To read about Scott’s crewing version of the race go here. Scott’s blog post will tell the lead-in story, the crewing story and the after story. I’ll just stick with the race itself because there is no reason for me to write any more than I have to! 🙂 Visit www.scottlivingston.net if you have not already been there. 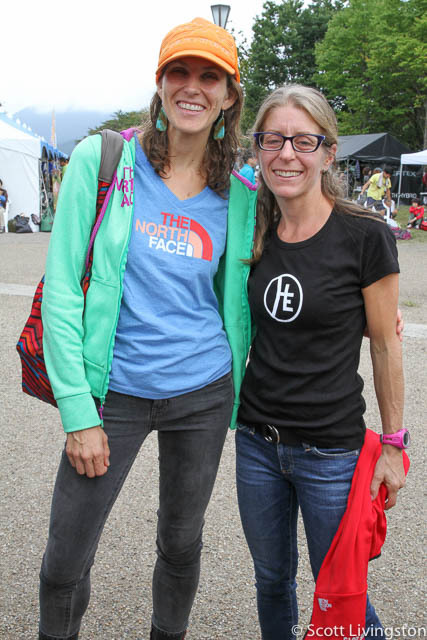 I found my friend Aliza Lapierre about 30 minutes before the start of the race. She runs for Salomon and they had a bunch of runners racing plus a local crew to support them. With 10 minutes to the start, Aliza told me to stick with her as her support crew whisked us to the front of the start line. 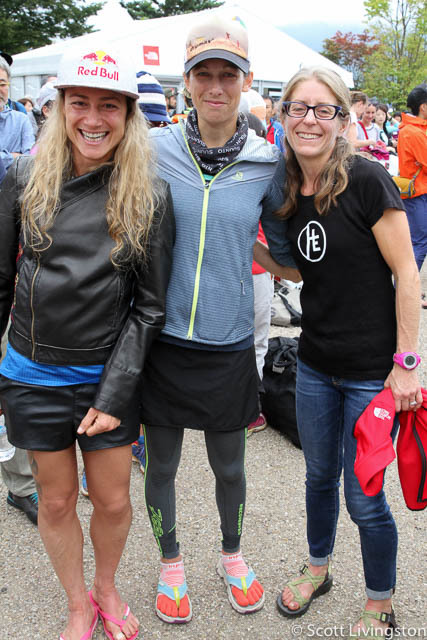 I was lined up next to Amy Sproston, Gary Robbins, Jeff Browning, two Tarahumara runners and many other great ultra runners. We squished in together along with nearly 1,400 other runners, with two minutes to go. It got bit claustrophobic at the start line with all those runners getting ready to start. The countdown came to 1 and we were off. I worked on staying upright and vied for a place in the narrow walkway. I watched Aliza and a half-dozen women move ahead. I did not want to burn myself out in the first 4 km but I also did not want to get stuck in a conga line when we moved to single track. We ran along the river and soon into the woods where the trail went straight up. It was a continuous line of runners for miles (or kilometers as they would say in Japan). The runners started to spread out. Eventually the trail went downhill for a fun and slippery descent. We popped out by some ice caves (I knew by the sign) and headed down a road. This segments was one of the re-routes due the the rain. There were two mountains we were not allowed to run on because the organizers and environmental groups felt the impact of 1,400 runners with wet ground would not be good. The road was slightly downhill the entire time but it was long and pounding. I was happy to finally get back on trails, but I was also dying to either find someone to run and chat with or be all alone. I found that most people did not want to talk or did not understand English. At this point, a female runner caught up and we started to chat. I found out she was from Flagstaff, AZ and quickly put two and two together. 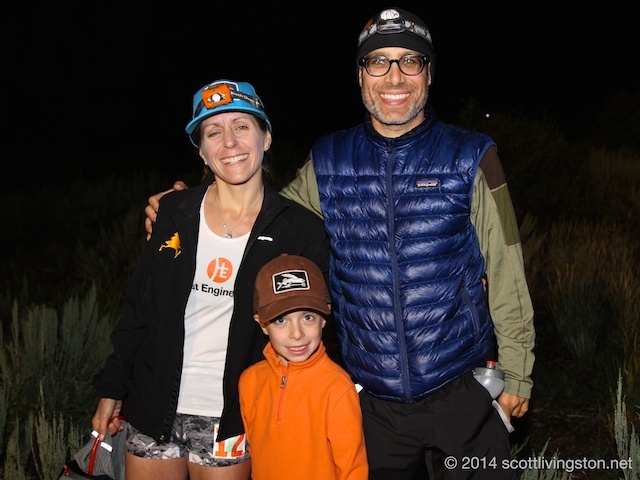 My coach Al Lyman had gone to Rob Krar’s Ultra Running Camp in Flagstaff and met Christina Bauer, his wife. Al knew she was running and told me too look out for her. We chatted a bit and she pulled away. At this point it was starting to get dark. I put on my headlamp and pulled out my handheld light. I realized pretty quickly that my headlamp was not nearly as bright as everyone else’s. My handheld was bright but was finicky. Every so often it would just shut off. I made do with what I had. Eventually, I fell into rhythm with another runner and we started talking. His name was Coonie and he lives in Tokyo but originally from New Zealand. It was so nice to have someone to chat with, plus he knew the course well, so he was able to warn me about what was to come. Just before Water Station 1 a videographer was running along side me asking me how things were going. I told him I was having a great time; running and meeting new friends. 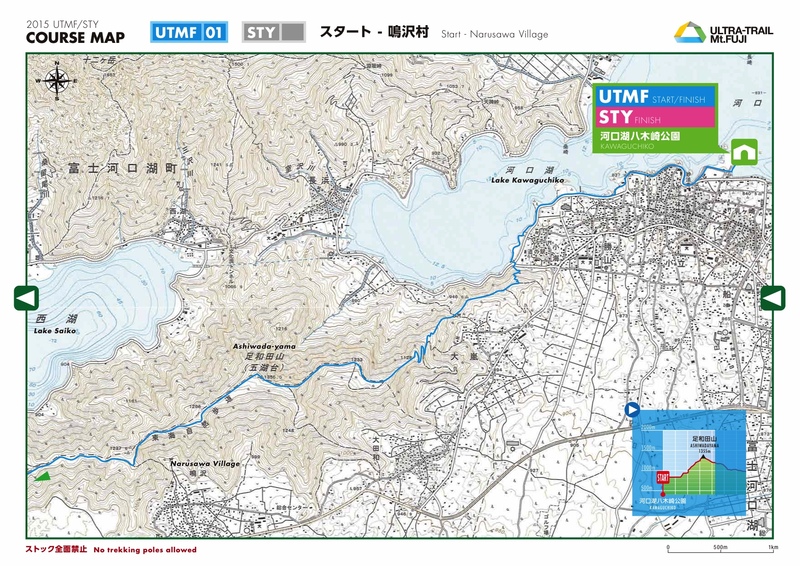 Coonie informed me the UTMF staff make a video for competitors to purchase. At the water station, Scott was there to greet me. It was bustling. 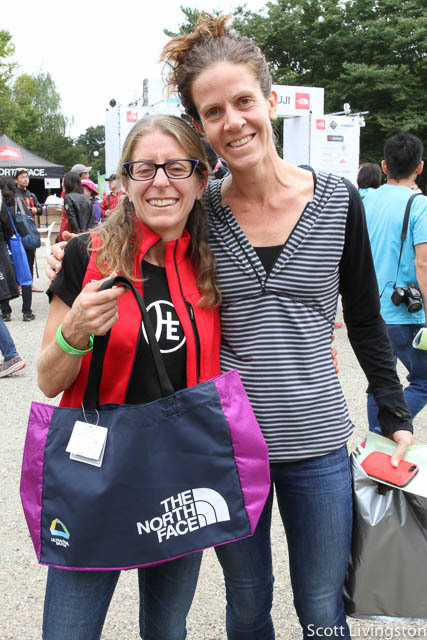 I filled the hydration bladder inside my UltrAspire Titan pack to the brim and went to the supporters area to pick up more gels and electrolytes from Scott. My friends at Ultraspire were kind enough to shorten the straps on a Titan and send it to me in advance of the race. My watch showed 50 km. Unfortunately, we realized that we left my race fuel bags back at the hotel! Luckily Rob Krar, who was crewing for his wife, was right next to us and he offered up some bars and gels. He was super helpful. I headed out into the Tenshi Mountains feeling confident. After a shoe wash station (we had to wipe our shoes in a bucket to knock off invasive species from the soles) the trail went straight up. And I am not kidding when I say straight up. Our friend, Rod Reynolds, said his GPS calculated 60% grade. The footing was terrible and slick. I wouldn’t call it a trail but instead a “way” up the mountain. Luckily there were some ropes and trees to hold on to once in a while. Once at the top it was finally runable again. I thought I was off course a couple of times in there, but was actually fine every time. I just waited to the next runner to catch up and continue on. Eventually the trail went downhill. Normally this is where I would tear it up, but the mud in Japan is like ice. it was insane. I tried “skiiing” down and that worked a bit until the trail had more rocks on the sides than weeds and I kept thinking how with one wrong fall the race could be over (i did hear of at least one broken arm in that section). In one of my hard falls, my headlamp flew off. My poor lighting did not help either. I found myself holding back a lot and was tense, which burned a lot of energy. I knew this section would take between three and four hours. Wrong! It took five and a half hours. I stopped at one point to change the batteries in my head lamp hoping that would help but it did little to increase the brightness (note to self – buy new headlamp!) Scott had offered to switch with me at Water Station 1, but I declined…..that was a bad mistake! I tried to take in a caffeinated gel thinking that it was getting late and I was starting to feel tired. 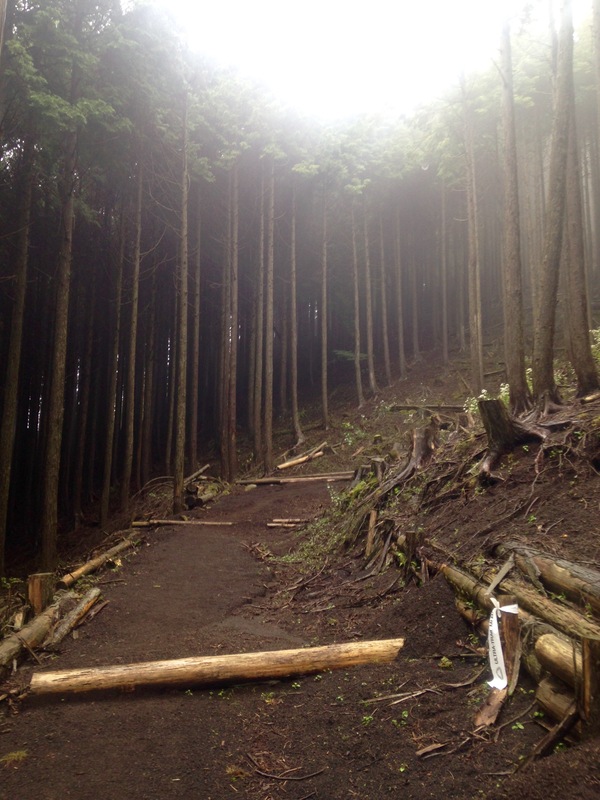 The course kept going up and down; more trail, more slick logs, more mud, more road…neverending power lines. At some point in there, my watch battery died. It was around 2am. I passed the Bridgestone Tire Company, ran up a sewer line (pew!) and finally into Aid Station 3. My stomach was starting to rebel a bit, and the front of my left ankle where my tendon sticks out was giving me a lot of pain as it had been pounding on my shoe for hours of downhill. I filled my bladder, sat down with Scott, loosened my shoelace and took a Tylenol. I immediately threw up. I have a gag reflex with pills and gels after hours of effort and eating energy food. Up came the water, banana and whatever else was down there. Luckily the Tylenol did not come up. I cautiously got some more food in me and headed out. I forgot to ask Scott for a new watch. At this point with so much time lost in the last section, I decided to stop racing and focus on running instead. Worrying about time and pace would not be good for my mental state. My main goal now was to reach the finish line. The next section went on and on. It was lots of dirt road with a slight incline. I came into step with a nice Aussie named Nick. He was tall and had a distinct advantage with hiking. I got him to run with me for a while and it was so nice to have someone to chat with. After many kilometers he needed to walk. I went on ahead but after some time, I needed a walk break. He caught up. We would yo-yo like this for hours. I eventually did pull away. 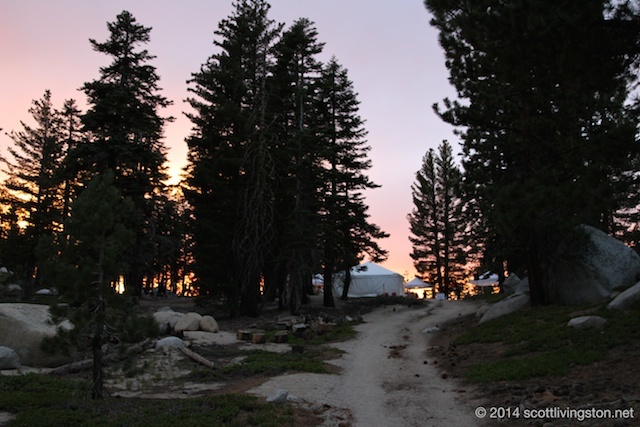 The sun was creeping up and by the time I ran into Aid Station 4, no lights were needed. There was the major drop bag station. I did not put together a drop bag since I had Scott crewing. I took a cup of green tea and headed back out. There was a short out and back section here, so I got to cheer for some fellow runners on the way back up, which was nice. I turned back into the woods and my phone vibrated. Scott sent me a text message that he would not be able to make the aid station and a bag would be left there for me. I told him I already passed through the aid station but he replied back that it was for Aid Station 5. I asked what happened, did he run out of gas? He wouldn’t answer. I figured if he is typing to me, then he must be okay. I don’t remember much in the next section. It’s funny how your mind can be selective or how everything seems to blur together. I do remember some of the trail being washed out river beds. I tried another caffeinated gel to give me a boost but it was not going down. We popped out on a road and here I got passed by two women. I must have slowed quite a bit through that section. I kept them in sight, we turned onto a field and had to run out to Aid Station 5 for 1.5k, turn around come right back. The field was soaking wet. If our feet were not already soaked, they were now! When I arrived at the aid station, Scott was there. I filled my bladder and sat for a second in the supporter area. He told me the abbreviated version of his ordeal; a flat tire in the middle of the night. The car had no spare, so it got towed and now we had no car. He would now do his best to keep seeing me at the aid station but that I should pack like I would not see him again. Gels were not going to work anymore, so I needed real food. I ate some potato chips. He made me a peanut butter and banana sandwich to go. I trudged back up the sloppy field as rain began to drop harder. Coonie caught back up to me and passed me. He was rallying. We climbed for a while and then the course rolled until we came upon a power line again. I was so sick of running on power lines! 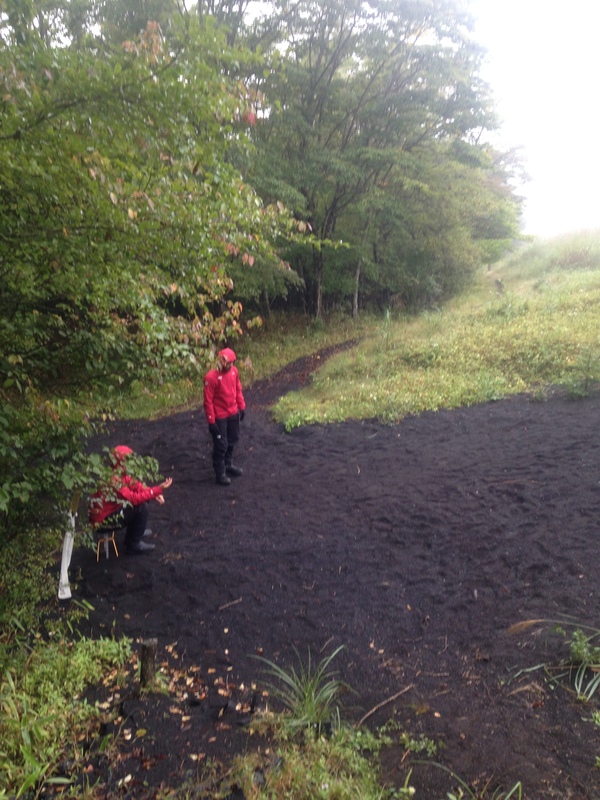 Eventually we did get off power lines and onto riverbeds and lava flows; which was loose black sand and rocks. It was very challenging to run on. It was nearly Impossible to run uphill on. And of course it went uphill. I was right next a Japanese woman, who (I later found out) was in her 50s. We ran together for quite a while. She was moving really well. 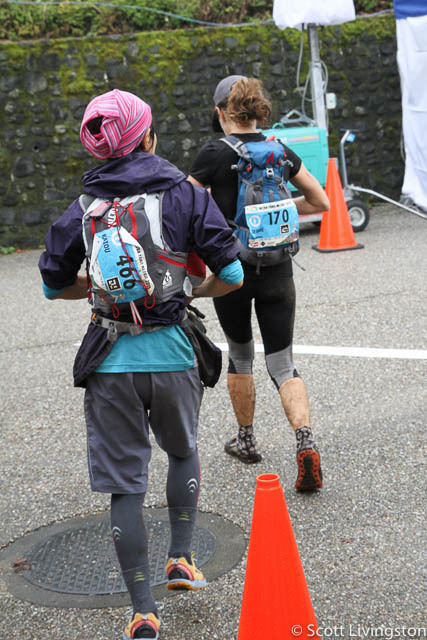 We came into Aid Station 6 together which was on the side of Mt Fuji. It was all lava rock. I took a bathroom break here but did not stay long. It was a very nice downhill on dirt roads and trail from that aid station. I was alone most of the time. After an hour or so I came out onto sidewalk and ran downhilll into Aid Station 7. Feeling decent, I said hello to Scott and continued on. I was right with the 50-year-old woman again and we communicated about wearing the same brand shoes. When the trail went up, off she went. i never saw her again (she ended up finishing 1.25 hours ahead of me and 1st in her age group). Road turned to trail and at the bottom of a big hill we were asked to wash our shoes again. A few feet up the trail I came upon a Japanese elk. By the time I thought about taking a picture he was on his way. The climb was tough but I found I was leading a few guys up. When it went downhill, I took off. It felt good to just flow downhill. I kept thinking that the next aid would be at the bottom of the descent but it was not. More road! This was the other re-route because of the rain. It was downhill but it hurt. I hoped that every corner I would see the aid station but at every turn it was not there. I began to whimper. The road was killing me! 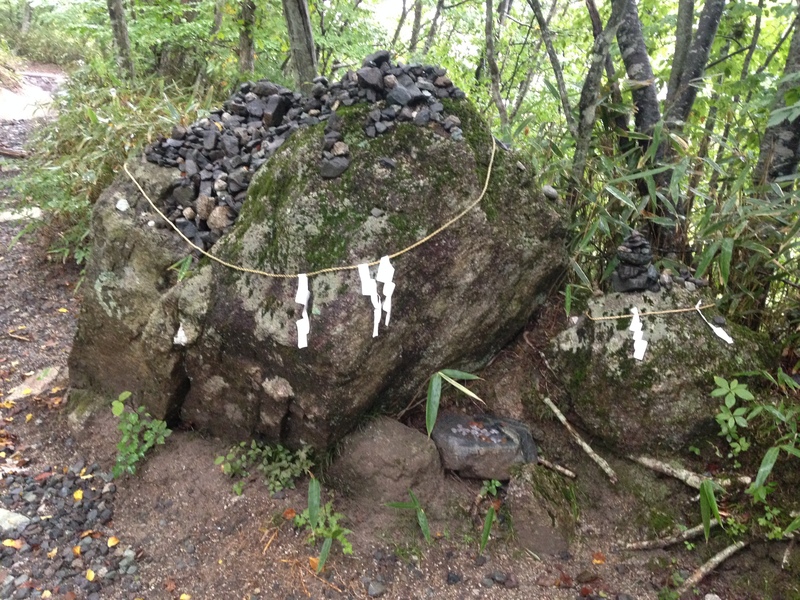 Eventually we were along Lake Yamanakako. Still no aid! I started alternating walking and running. I would walk to one power pole and then run to the next, and then repeat the sequence. I needed to move forward but I wanted a break from the pounding. I asked someone how much farther and the response I got was 3 km. What!!?? I let out an audible sigh and then worked on changing my mindset. I could see the aid now and then I saw Scott cheering me in. I stepped into the tent and was told this was a mandatory gear check. I was a little loopy so I had a hard time understanding what they were asking for but I was able to produce everything they needed to see. I sat down with Scott, let out a few tears and told him how much the road was hurting me. He started to rub my legs but the volunteers said if I wanted massage I needed to go the massage table. I said let’s do it. Boy, this guy was a masochist. Luckily there was a very nice woman next to me who would translate my words to Japanese, “too much.” As much as it hurt, it also felt good and I was ready to go when he was done. Another peanut butter and banana sandwich, more potato chips and lemonade and it was time to get out of there. I left walking, trying to eat and recuperate a bit. I turned onto a dirt road where there was a shoe washing station at the end. Right after the trail headed uphill on switchbacks. This section was a lot of fun. There were rocks to scramble over and ropes to help pull you up. I then enjoyed a slightly slippery and crazy downhill to Aid Station 9. Crew was not allowed here. I topped off my water and quickly moved on. I knew it was about 14 km to the next aid station so I kept my mind occupied and my legs moving. I thought maybe, just maybe, I could make it in before dark. But because of wearing no watch and my mistake in thinking I only had a total of 20 km left; I was wrong and that would not happen. Luckily we stayed in the woods on trails with lots of turns as well as ups and downs which eventually turned to a long easily runable downhill which I took with gusto. It was super fun and I was making up time. I had to make a quick stop to pull out my headlamp which I held off, stopping only when I could hardly see the ground. I noticed my right toe was in pain and i figured that I developed a blister but ignored the pain and kept going hard. I dumped out onto road and thought the aid must be just down the street. Boy, was I wrong again! They wove us up and down streets, around corners stationed with volunteers holding red lights and some with flashing headbands. Aid Station 10 could not come fast enough. It surprised me to see Scott there along with our friend, Rod, and his wife, Nancy, from Hong Kong. He was supposed to be in the race. I found out he had dropped and came to cheer me on. I filled my hydration pack one last time and asked how long to the finish. The answer I got was not what i wanted; 12 km! Oh well, I thought, let’s get this done. After being up to 30 minutes ahead of me, Christina, Rob Krar’s wife, was just seconds ahead now. I ran after her and just as I was about to head up stairs and over a road I saw Rob. I stopped, thanked him for all his help and continued on. I caught up to Christina and chatted a bit, but she soon took off on the uphill where I knew I would struggle. I focused on climbing; watching the bugs light up with my head lamp and I noticed white rocks and fungus glowing back at me. It is amazing how heightened your awareness becomes and night and when you’re tired. I passed a volunteer playing the Rocky theme song with his saxophone. I was dying for downhill, but instead got a rolling trail for a few kilometers. 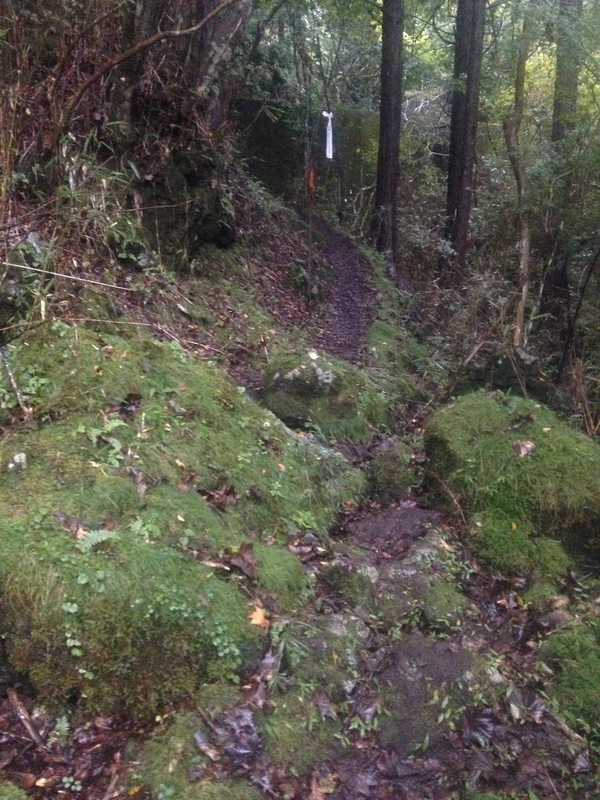 When the trail did turn downhill it was a crazy switchback with loose dirt and some muddy spots. I let go of all worry. I was ready to be done. 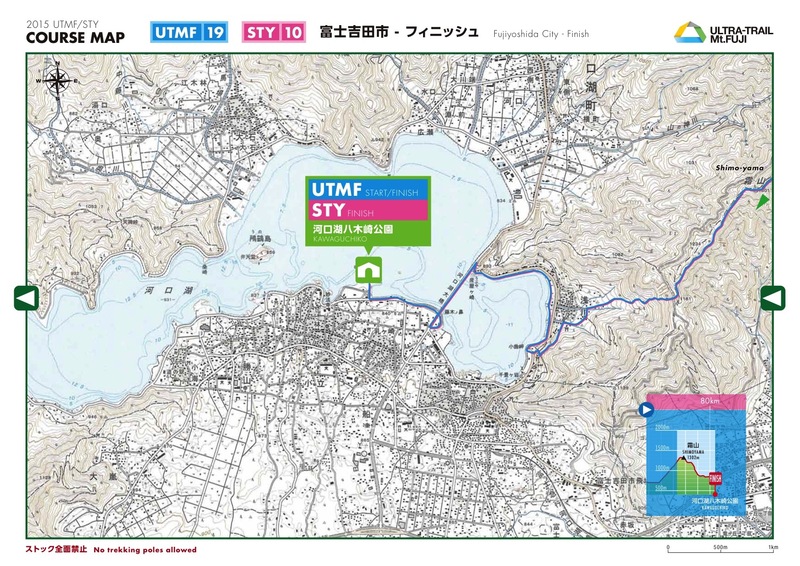 I just prayed that my legs would still work on the last 2.5 km around Lake Kawaguchiko. I passed a few people and came out to an observation deck with a beautiful view of the lake. It was dark, so the view was all lights. Blue and white LED candles lit the way down ramps and stairs and onto the lake walkway. I knew this last part well since Scott and I were staying right on the lake and had run the loop before. I focused on keeping a steady pace. I kept looking for someone, anyone, ahead of me. Just before the turn onto the bridge I passed a runner. I gave him encouragement, something like, “Let’s get this done.” The bridge felt longer than before. I knew I only had about 1 km remaining. A turn down the stairs and alongside the lake. At long last the finish line was there. As I ran to it, volunteers held up a tape to run through. I felt a little silly crossing the tape, but I realized that they love cheering and congratulating everyone who finishes because just finishing is an amazing feat. I crossed the line in 32 hours 15 minutes. I was 16th woman. And the course was more like 180k (110 miles) instead of 169k. To tell you the truth I was a little disappointed with my finish place and time BUT then I reminded myself that I was able to complete this beast and not everyone can or did. I don’t need to “race” every race, sometimes it’s good to just run! I cannot even count the number of volunteers I saw out on the course. 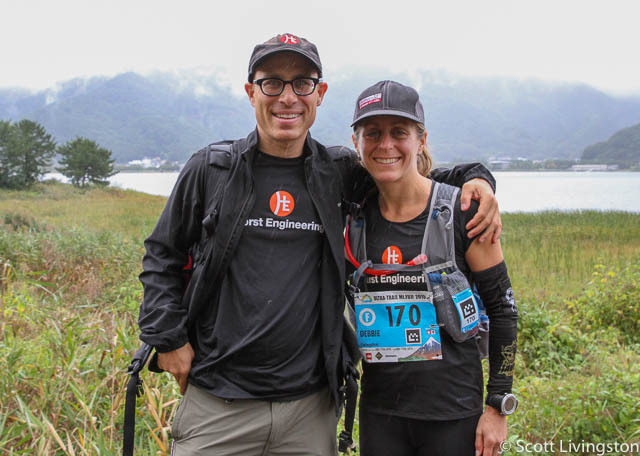 There were dozens at aid stations, volunteers dressed in panda suits in the forest, people camping on the mountain tops….they were fantastic. I am so thankful for my husband who is an amazing crew even when challenges arise. My coach, Al Lyman, is a huge supporter and keeps me strong and resilient. Thank goodness for UltrAspire who fixed that Titan pack to fit my small frame so I could carry all the mandatory gear. It take a village to complete an ultra like this! 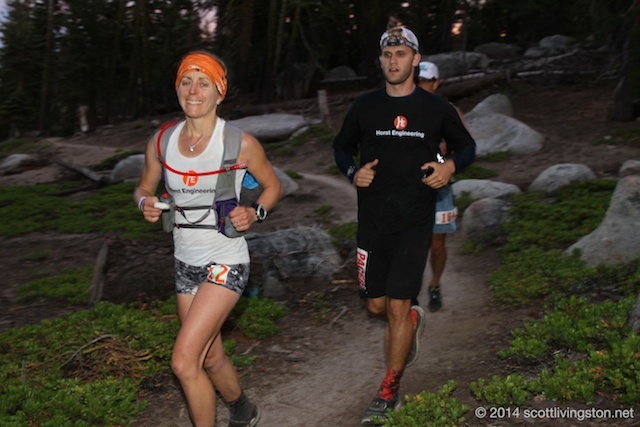 The Speedgoat Mountain Trail Races were wild. Karl’s Speedgoat 50k has been on my to do list for a couple years. 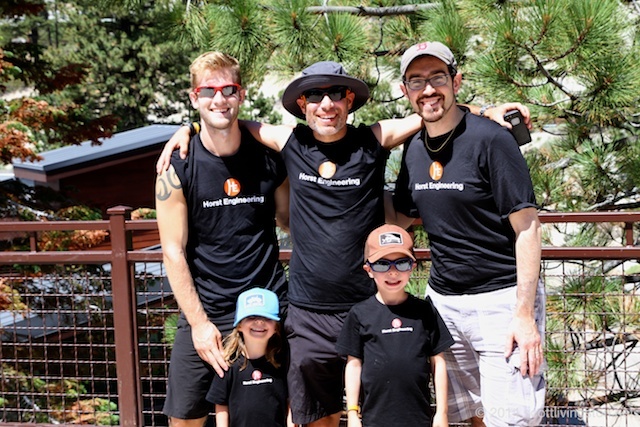 This year Karl added a Vertical Mile Race as well as a downhill race called the Quadbanger. It made sense to me to sign up for all three since it is a race at altitude and there would be a lot of climbing which we can’t simulate in Connecticut and that would mean no chance of a top five finish. Instead I chose to focus on my ability to be able to race, recover and race again; three days in a row. Scott and I arrived in Salt Lake City on Thursday and after renting a car drive straight to Sage’s Vegetarian Cafe. It had been seven years since we had been there. 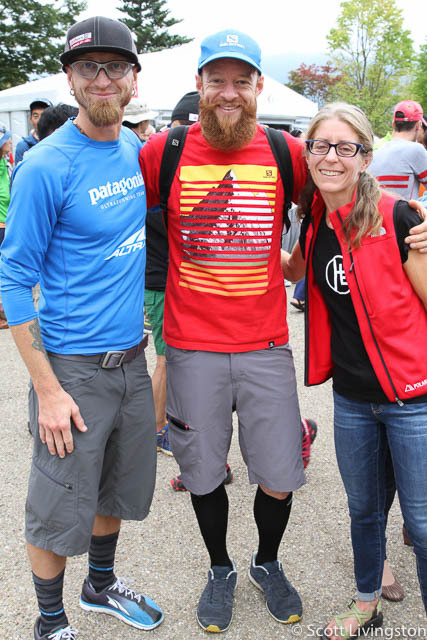 We bumped into Sage Canaday (multiple Speeedgoat winner and fellow vegetarian) and his girlfriend Sandy Nypaver. We said hello, exchanged pleasantries and headed up the Cottonwood Canyon to Snowbird. After a good nights sleep, a machine shop visit and lunch at the Vertical Cafe (another veg restaurant) we got ourselves to the start line of the Vertical Mile at 3pm. Scott took off ahead (he is a much stronger climber than me). After an initial sharp heart rate increase I felt more comfortable. We climbed steadily; winding and twisted mostly on dirt access roads. The time went by slowly. I made the incorrect assumption that the race totaled four miles and I knew there were two separate climbs, so I asked the guy next to me what was up. He confirmed that I was world the first climb would be four miles and the second two miles, totaling six miles. I had read the website incorrectly. I didn’t sweat it. I focused on the beauty. The sun was warm, the sky a brilliant blue and the huge mountains breathtaking. I made it to the chairlift, jumped on with a few other competitors and headed downhill for the second climb. Riding the chair lift was a fun break from the grueling uphill. It took longer than I thought it would, but when I reached the bottom, I promptly stepped off and was directed to the second part of the climb. I enjoyed this part much more. The first mile consisted of mostly overgrown single track.. I began to pass people and seemed to get stronger as I got higher. The trail turned into an amazing ridge climb that put a smile on my face for the rest of the race. As I traversed the ridge the finish was in sight….just on the opposite side of the tram. I completed the Vertical Mile as fifth female in 1:57:48. We piled into the tram for the trip down. On the tram I finally meet, face to face, the makers of my favorite hydration pack; Bryce Thatcher and his lovely wife Melanie. I have been sponsored by Ultraspire for the past three years and feel it’s the best on the market. They are very smart and kind. We slept okay in the Lodge at Snowbird and got up early to eat, get dressed and walk the 15 minutes to Creekside. The patio was buzzing with over 400 competitors; some with the hope of placing and most ith the hope of just finishing. 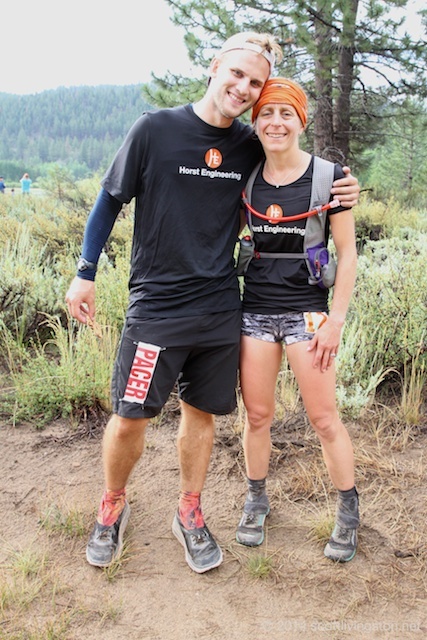 The Speedgoat 50k brings out great talent because it is a true test of strength and placing top three means prize money. My goal was to run well, feel good and not finish trashed. I was secretly hoping for a top ten finish too but as soon as Karl shouted, “Go” at 6:30am and I watched everyone fly up the service road I knew it would be a bit of a dream but I did not let that deter me…..the longer I go the better I get. The climb turned into a windy single track which was fun but a little annoying because I was stuck in a congo line. I relaxed and went with the flow; I knew it would be a long day ahead anyways. My plan was to run all the slight inclines and downhills and hike all the steeper uphills. The only problem was that every time I slowed to a hike I got passed. I just could not keep up with the uphill speed of most. I know part of it is my lack of mountains near me to train on but I could also feel the altitude was affecting me. Luckily we own a Hypoxico altitude tent and I slept in it for eight weeks leading into the races. I would not want to know what it would feel like without that thing. After eight miles of mostly uphill I came to the top of Hidden Peak, it was time for a long downhill. On the way up I had already made some friends; a local named Amie and a fun girl originally from New Hampshire named Trish. Scott greeted me there and informed me there we about 25 woman ahead. Yikes! Really? I refilled my UltrAspire bladder, grabbed a couple more Vfuels and moved on. An awesome two+ mile downhill to Mineral Basin allowed me to move up a few spots. 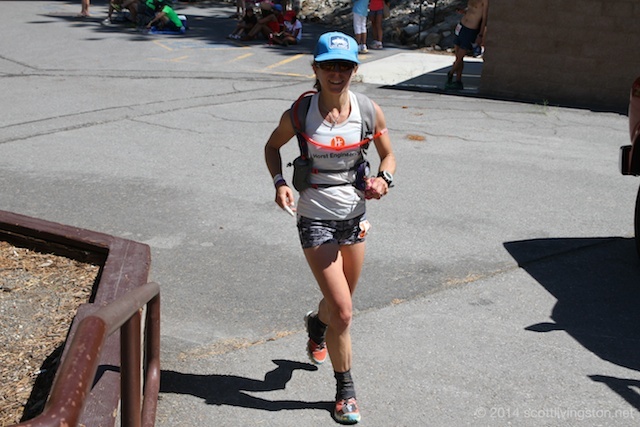 I ran right through Mineral Basin Aid Station and pushed on to Pacific Mine Aid Station. It was only a half mile further on the trail that I saw Sage Canaday coming toward us (there was a short overlap in the course). He was miles ahead! There was some climbing in that section but mostly a long rock-laden downhill road which again moved me up a few spots. People run cautiously on rocky areas, I like to go faster. I refilled at Pacific Mine and soaked my bandana in water knowing that what goes down must go up and it was heating up. The climb out of that aid station was miles long but I moved well and only lost a place or two but gained on one female. We went through an Aspen Forest and many fields of flowers. The trail got rockier until eventually we got to head downhill back into Mineral Basin. Scott was there to help me refill water and food. It was really hot now. I started to notice my skin on my arms were getting red. I added more sunscreen and Scott ran up the trail with me for a bit. In a short while it was too steep to run again. I slowed to a walk, Scott sat on a rock to take more photos and quickly tipped over. It was nice comic relief. This climb up Mount Baldy was exposed and steep (40- 50% grade), but this is where some of the best views and wild flowers were. When I reached the high point I ran across the ridge top, having a blast. This part of the trail was ruling and laden with rocks which I love. Scott was on top taking photo and cheering. As I passed he said he would see me at the finish. I danced across the top and went around the curve to drop slightly into Tunnel Aid Station. I had a full refill here and then was directed into the tunnel. This was so cool!! The course went through the mountain where skier stand on people movers in the winter to get from one side of the mountain to the other. It was NOT all downhill from there. Although we overlapped a favorite scree trail (that we took on the way up) where I passed another female. I was on a mission to finish. There was a lot of down, a few more ups and then a single track switchback that seemed to never end. I crossed the finish line in 8:51:54; good enough for 20th place female. Unfortunately, my stomach went south as soon as I finished. I felt fine the entire race…..I think it was from a couple of caffeinated salt tablets I swallowed with about seven hours in. Scott was there to help me recover. We eventually walked back to the hotel where I cleaned up, rested and settled my stomach. The next day, to get to the start of the Quadbanger, we had to take a ride the tram. All runners and volunteers boarded the tram at 10:30am. The ride to the top took about 15 minutes. I met up with two super cool athletes while on the tram; Meredith and Paul Terenova. I had know them through friends and social media but we had never spent time together. We piled off on top, received instructions from Karl (letting us know to be careful because there is no dentist on staff) and at 11am we were off. The first two miles were switchback dirt road. I stayed right with Meredith. I knew she would be an awesome downhill runner. My quads were a little upset with me from the challenge of the 50k the day before, but I was able to put that aside and motor on. The course turned into a bit of single track, back on dirt road with a final switchback of single track where every time I was able to catch up with Meredith and pull ahead slightly. That was also where I hit the ground hard a couple times. My leg muscles were not able to keep my upright as they usually do with little missteps. Luckily, each time we ended up on the chairlift together. She was a hoot to ride with. Meredith is afraid of heights and clung onto the bars for dear life. We had great conversations and even saw some wildlife (a woodchuck, a deer and moose). The top of the chair lift was not as high as the tram, cutting off about a half mile for the next three runs down. Each time I got off the lift my legs were more and more stiff. On the final decent, Meredith took off down the dirt road switchbacks. I knew I needed to forget the pain and the worry that my legs would give out and just lean into it if I wanted any chance of a close race. I came all the was out here and got their far; I might as well go for it. Surprisingly, I keep up pretty well and passed Meredith in the single track switchbacks. I told her to out-sprint me on the last rolling section to the finish line. I wanted both of us to have a strong finish. She responded that that was unlikely. But I found my legs and pressed on the gas to cross the finish line first. Meredith crossed about 30 seconds later. The distance was about 11 miles and my time was 1:32:54. 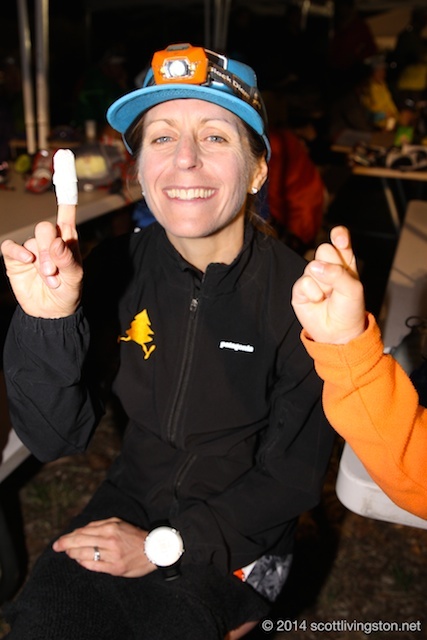 This was the most fun I think I ever had in a trail race. Karl gave me a high five and a cool trophy. It also did not hurt that there was prize money for this race as well as coming in first for all three events. I would have liked some competition in the three event category but I guess I am a little crazier than most! Kudos to Karl and all his amazing volunteers. Thank you to Scott for supporting me, taking photos and caring for me. Thank you to Al Lyman, my fabulous coach, that guides me to strength and resiliency. Thank you to UltrAspire for hydration packs that never fail me. Thank you to Julbo for protecting me eyes. That Utah sun was powerful! 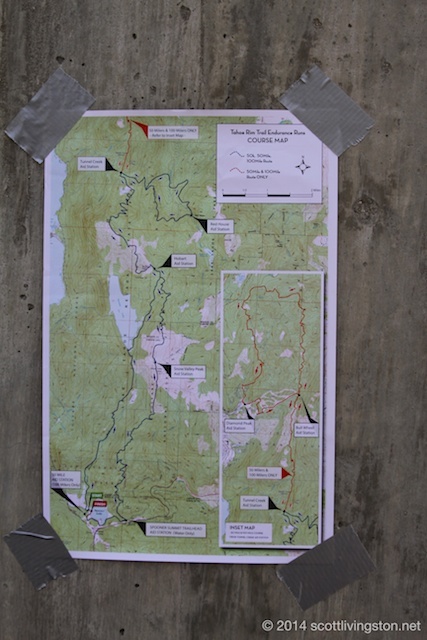 To see photos and Scott’s (more detailed) view of the Speedgoat Mountain Trail Races go here. 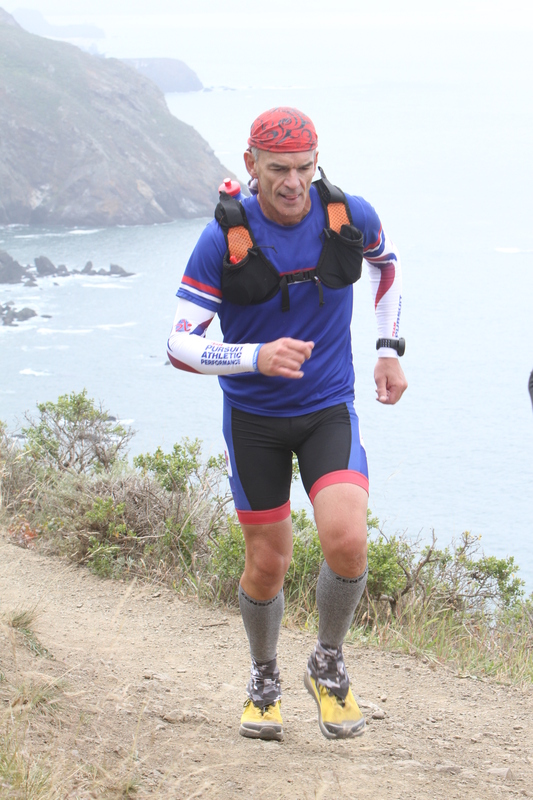 Since I am months away from the completion of Miwok 100k I thought it was best to just write about the highlights and throw in some photos. 1) Competing in the same race as my coach, Al. He has been my cheerleader for over five years. I thought about him a lot while on course. Wondering how he was faring and cheering for him mentally. 2) The beautiful scenery. From sweeping vistas to the Golden Gate Bridge to behemoth redwoods. 3) Strong running for (almost) the entire race. I only felt a bit of faltering around 32 miles but was able to get over it and continue with a good pace and good state of mind. 4) Strong finish. All downhill and switchbacks allowed my strengths to surface for a strong end to 100k. My quads let me know the next day that I was able to put the effort in! 5) 4th place woman. I was very happy with 4th place (only five minutes out of third). I put a lot of training and effort into performing well and fortunately, it showed. It was wonderful to have my usual crew in place for Miwok. Scott and my kids were fabulous cheerleaders and pit crew. They even helped out Terry and AJ who were crewing for Al. Cousin Danny, with his unwavering support, was an awesome pacer AGAIN. He drives hours each time to give us support and we appreciate it! It was also wonderful to have cousin Tim and Sara with their little boy Logan helping and cheering as well. Congratulations go to my coach, Al, who completed his first 100k. I know his mind wasn’t in the best place for a big challenge like this but he persevered and crossed that finish line. And a huge thank you to the RD, Tia Bodington and her volunteers, for making this race happen. I had a fabulous time on the course and appreciate all the hard work that goes into putting on a race of this distance and size. A few weeks ago I traveled up to Killington, VT on my own to compete in a different style of race than I normally run. 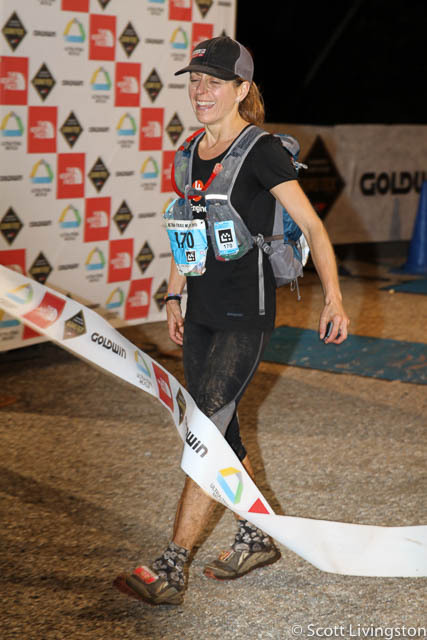 After 16 years of ultra-distance trail running I wanted an athletic experience where there were no expectations. Years ago Scott and I competed in adventure racing and found some success in it, so I figured obstacle course racing wouldn’t be much different. 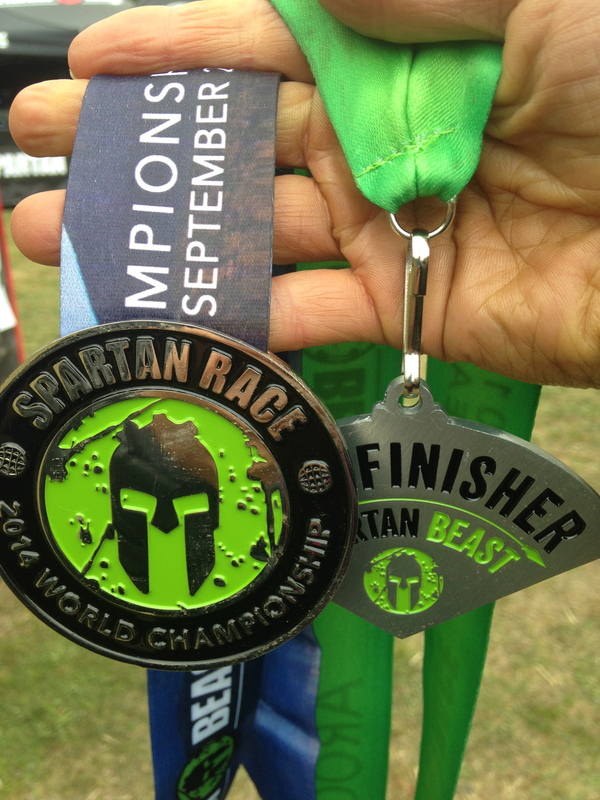 It was the Spartan Beast. 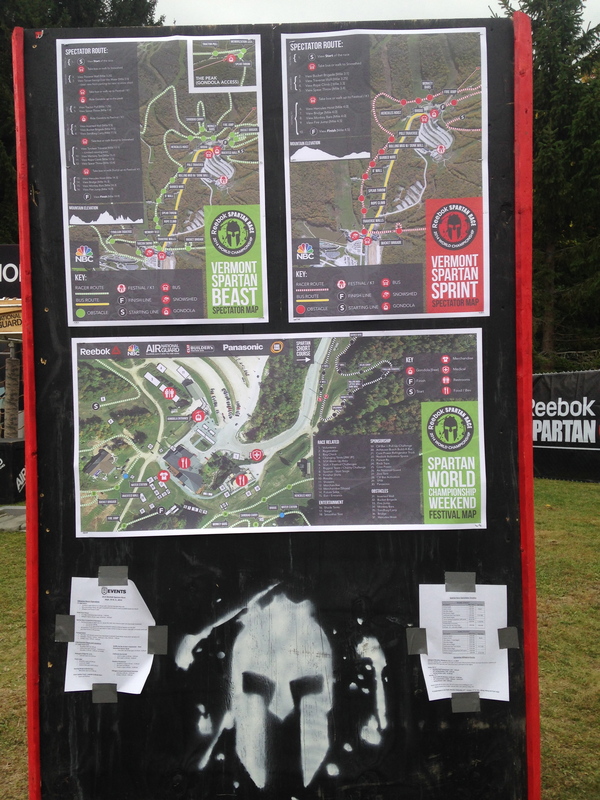 A half-marathon course that went up Killington Mountain more times than I can remember and had over 30 obstacles to complete. I signed up for the elite woman’s start knowing that I would be very mad if I had to wait in line for any of the obstacles. The elite woman started 15 minutes after the elite men at 7:45am. 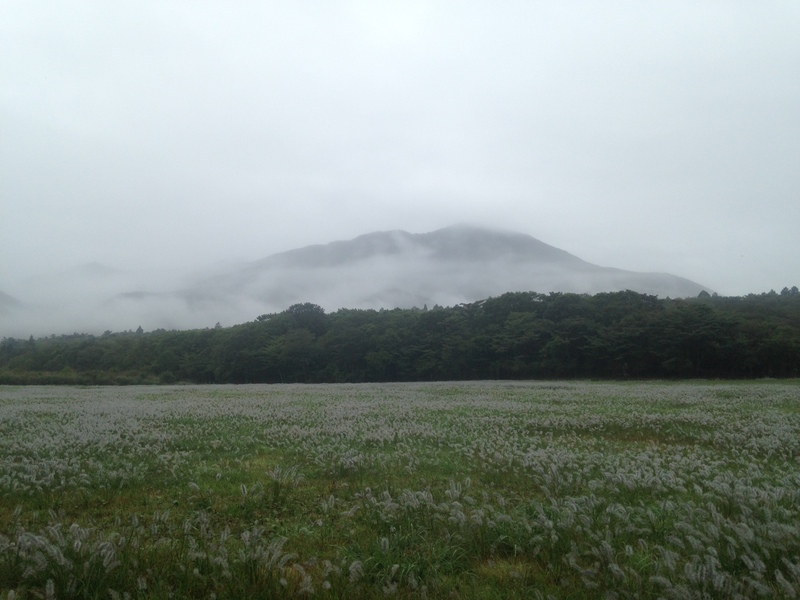 The day was chilly and the mountain fogged in. I had more clothes on than most of the woman there. This is what I learned from the race. 1. Run hard on all the running sections because this is the only place where you can get ahead. 2. Strengthen your hand grip. Just half-way through I could barely use my hands which obviously gave me a huge disadvantage on all the rest of the obstacles. 3. Grow a few inches. Not like anyone can but if there was a way…. Short people are at a disadvantage from the get-go with most of the obstacles. 4. Practice burpees. I must have had to perform over 300 of them! 5. Carry more food and water than you think. There is little drinking water and no food out there and you will most likely be on course longer than you planned. 6. Practice swimming fully clothes with hydration pack on. It feels really weird and slows you down, but if you know how it feels before the race you’ll be more comfortable with it in the middle of the race. 7. Get really good at running, stepping on, and then jumping up walls. The big wall almost brought me to tears, as dozens of people whizzed over. I have no up. That’s why I don’t play basketball! 8. Practice monkey bars, but not just regular monkey bars; ones that go up and down, ones that are square (yes square! ), ones that have wide pipe on them. Practice on wet, muddy bars too. Practice for grip strength and also to harden your hands. 9. Gain some weight. I could not budge the tire pull even with all my weight leveraged behind the stake! The sandbags were also half my weight! 10. Learn how to throw a spear (or javelin). There is a lot of technique to it, not just strength and it can save you 30 burpees without a lot of effort! 11. Carry a 50 lb. sand bag(or two if your male) and buckets full of rocks everywhere. Learn the best technique for you. 12. Be ready to laugh at yourself. There were so many times where the frustration level was high but instead I just smiled and laughed at the absurdity of it all. After running the 1st half of the race in the top 20 I dropped back to 45th in the elite group which was quite decent considering this was my first obstacle course race and I did not train specifically for it. 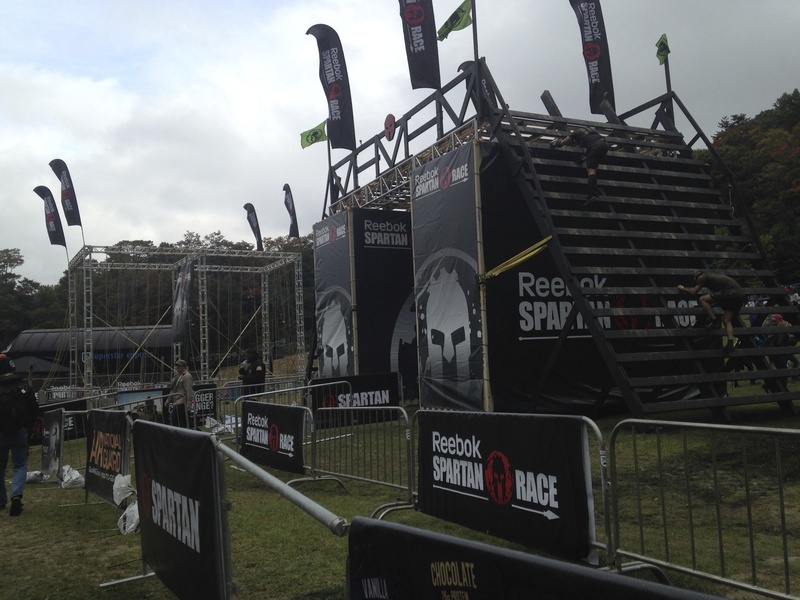 Also, it was the “World Championships” for the Spartan races and brought in top OCR athletes from all over the world. Will I do it again? Maybe, but I would have a better experience if I grew a few inches and gained a few pounds. There is a distinct advantage on most of the obstacles if you have more height and weight. Obviously, I will not be growing taller anytime soon so I would need to be stronger and faster than those that are taller just to be at the same level. I could gain some weight (with muscle) though. I am not afraid of training hard. But on another note, I am also not a fan of how they asked for money in every way possible. 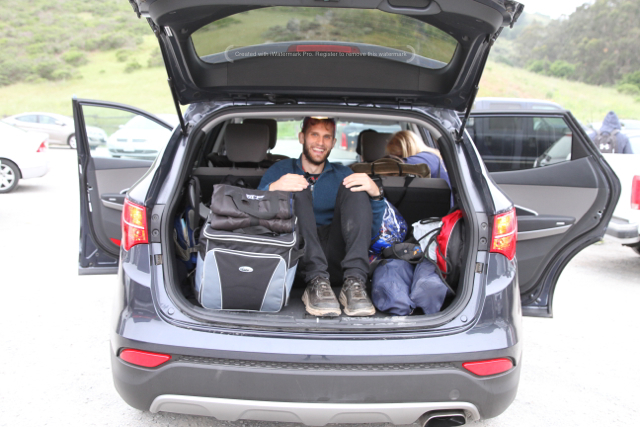 Entry, insurance, spectator viewing, parking, bag check…. aye, yai, yai. That is the one thing that may keep me away. 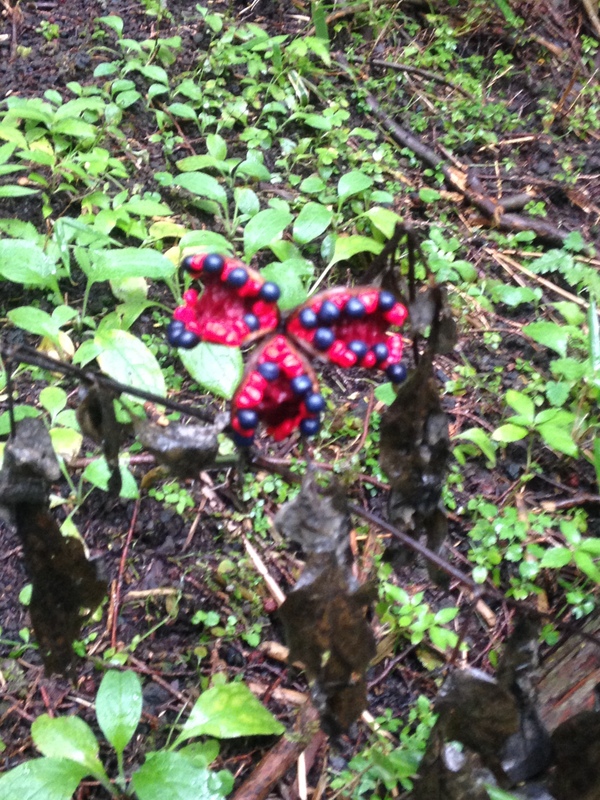 It was so nice to be back in the woods of Vermont. Vermont is Scott and my favorite state. We love the climbs, the views, the vegetation and the feel. 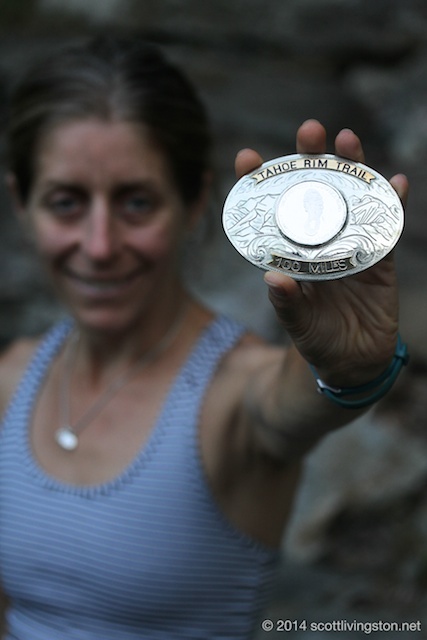 I had run the Peak 50 mile race back in 2007 and 2008. 2007 was it’s first year and it was closer to 56 miles with some adventure challenges thrown in. I had a blast both years but chose to race elsewhere since then. After a visit a few months ago to the race headquarters I knew it was time to go back. Shep and Dahlia were psyched to camp out in our VW Pop Top, so we chose to drive up later on Friday and park at Riverside Farm very close to the start. It would have been a great spot except for all the cars driving in and out all night. Needless to say we didn’t get much sleep. Also, my plan, after many talks with Coach Al, was to get up at 3am and eat 500 -1,000 calories. It wasn’t hard to get up but it was hard to eat. I choked down some gluten free pancakes with peanut butter between along with a serving of chocolate Vega. I finally crawled out of my sleeping bag at 5am, got ready to race, and had a serving of Osmo Pre-hydrator with 16 oz of water and one VFuel. 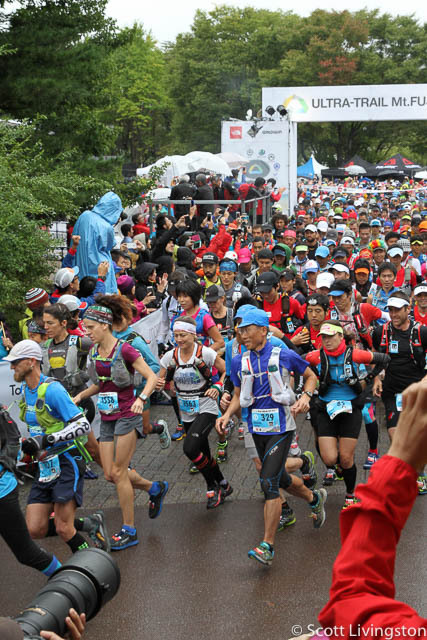 The race started without much fanfare along with the 100-mile race. We went straight while they all took a right turn onto a ten-mile loop that they would repeat 10 times. We would come back to that loop for our last ten miles. In less than 2 miles we had a knee-deep river crossing. It was cold but fun. After the water and after crossing Rte 100 I got into a rhythm and chatted with some of the runners around me. Eventually we hit a bushwhack where the only indicator that we were on course was pink flagging. There was so much moose poop out there that I joked with one of the runners that a moose helped mark the course. After a big climb up and over Wilcox Mountain we arrived on an ATV trail and then dirt roads. The bushwhack was about 1.5 miles an really slowed the race down but I loved every minute of it. A little over 12 miles brought me to Upper Michigan Aid Station. After a short road out and back I met up with my crew and switched my UltrAspire hydration pack with a fully stocked one. I ate a handful of salted boiled potatoes, kissed my family and headed down the trail. The Bloodroot loop is long; longer than I calculated. Some of the climbs are 40% and miles long, the mud was relentless and deep. I didn’t take enough food, but I did not realized it until I hit the 31 mile aid station thinking it was the 27 mile one where I would see Scott again (it was 37, not 27!). I had 6 more up and down, muddy miles to go and none of my personal food remaining. I was carefully planning my intake and the plan was going very well. Hour 1 and 2 was EFS gel, hour 3 was EFS electrolyte drink and salted boiled potatoes. The pattern was to be repeated until the end. 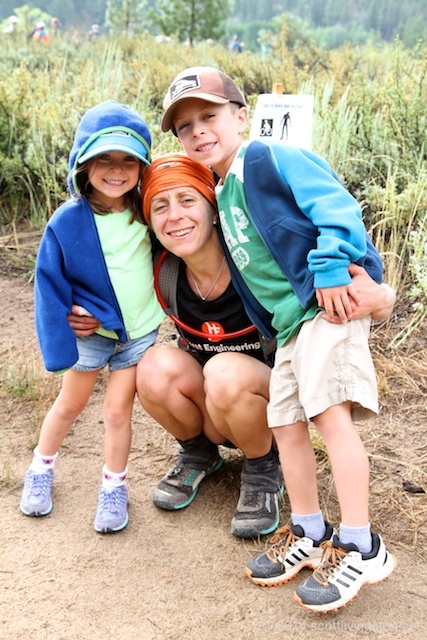 My stomach felt great and my energy was good, but when I realized at the aid station I was still 1.5 – 2 hours away from my crew I had to make some decisions. I filled my pack ½ way and scanned the aid station table. Barbeque flavored potato chip, yuck! Processed cookies, yuck! I panicked a bit but then spotted some honey-roasted peanuts. They would have to do. I took 2 handfuls and sped off. Luckily the peanuts digested well and I was able to negotiate the next 6 miles at an okay pace, although I did feel a bit dizzy toward the end. I made it back to my crew without crashing. I asked for more salted boiled potatoes and a full bottle of electrolyte drink, which I downed. I was back in action! Three miles of mostly downhill dirt road running now to take me back to Riverside Farm where I needed to run under 2 hours to get in before 11 hours. I knew I was going to be okay by the 8.5 – 9 min pace I was able to hold all the way to the farm. The loop consisted of steep inclines many switchbacks, with a nice long (3-4 mile) downhill after reaching Shrek’s cabin 9top of the mountain). I struggled on the climb but once I got rolling downhill I started feeling stronger. My watch was under -calculating the miles through the last loop because of all the switches. I was passing many people but could not tell which race they were in. There was a 15 mile, 30 mile, 50 mile, 100 mile, 200 mile and 500 mile race going on at the same time. 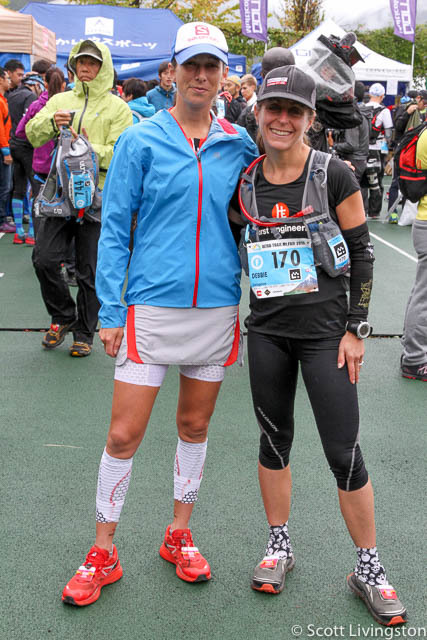 The competitors in the 500 miler, especially my friend, Michelle Roy, were very inspiring! So, as I pushed the pace and was reveling in my ability to do so (I had not be able to finish strong in a long time) I kept looking for the finish line but each time the trail got closer to the farm it would loop away again until finally the course took me right into the finish. I crossed in 10 hours 56 minutes. I ended up fifth overall and first woman but my biggest success was not in winning but in being able to run consistently strong again and have no stomach issues. My stomach was in such good condition that I was able to enjoy a picnic with my family after. That was the best prize of all!